Avast Security for Mac has a built-in reporting tool that generates a "support package" to be sent as a reference for Avast Support representatives. If a support package has been requested by an Avast Support representative, you can generate it from the Help section. In the Avast Security Menu bar on the top-left of the screen, select Help ▸ Avast Technical Support ▸ Generate support package. 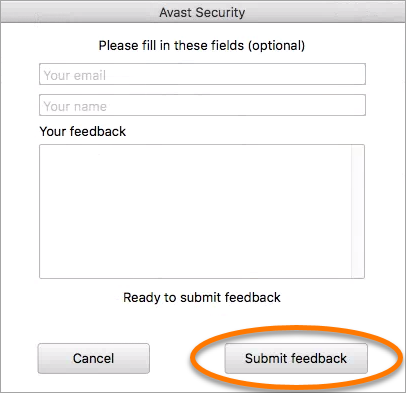 Fill in your email and name in the feedback form and copy your support ticket number to the Your feedback field to allow Avast Support representative to connect your issue with a support package. Click Submit feedback and Avast Security automatically gathers necessary files and sends them to Avast Support for analysis.